I’ll confess this recipe is more my Mum’s than mine, I made it last weekend under her instruction. 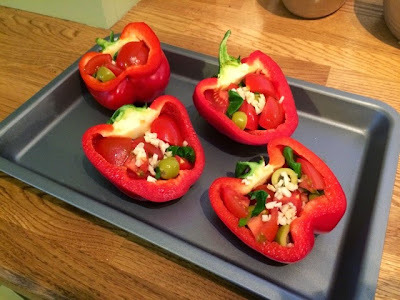 Inspired by an old Delia recipe, these peppers are stuffed to the brim with tomatoes with olives and garlic for flavour and filled with oil and are a much lighter alternative to your more common rice or cous cous stuffed peppers. 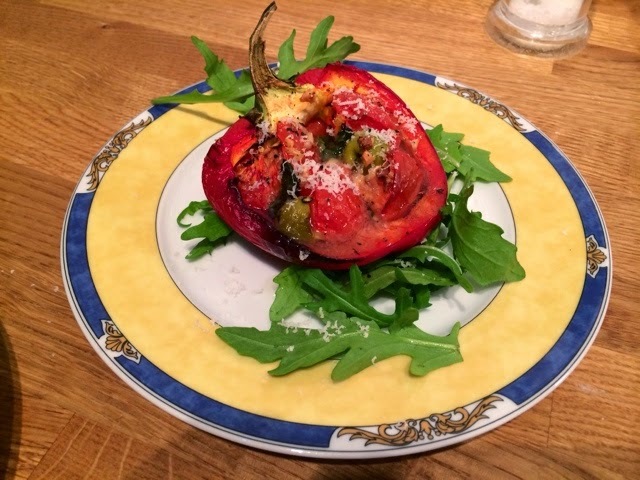 You could have two halves with a side salad and maybe some rice for a main meal, but a half a pepper makes quite a nice starter served on a bed of rocket. 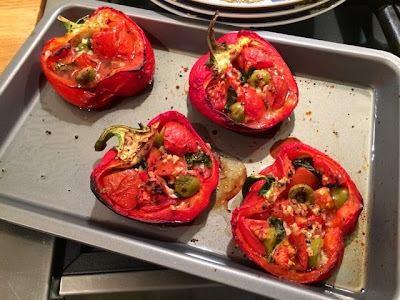 This is a light and delicious starter I’ll definitely be making again. There’s just something rustic and Italian about the way it looks that I love and it’s really tasty too. 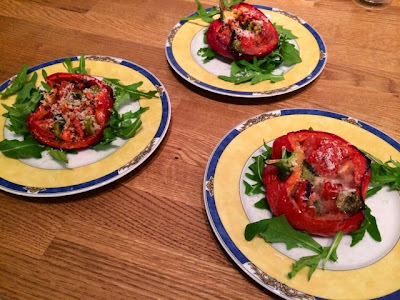 Feel free to play about with the ingredients you stuff it with, a few oozy lumps of mozzarella might be nice but I’d recommend you keep the tomato base. 1. Preheat the oven to 180°C. 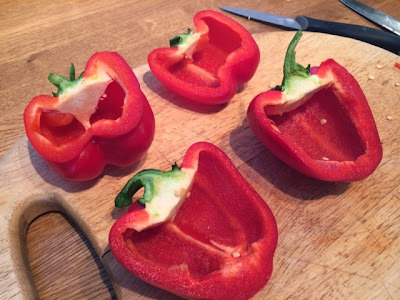 Halve the peppers lengthways and remove all core and seeds, leaving the top on to help them hold their shape. 2. Stuff the peppers with the tomatoes, basil, garlic and olives until you can’t possibly squeeze any more in. 3. 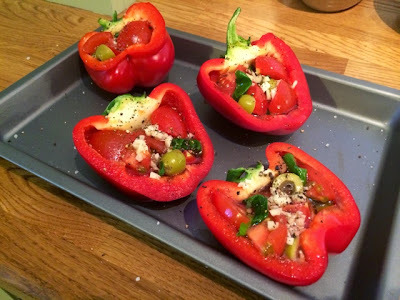 Pour in olive oil to fill them up and season generously with salt and pepper. 4. Place in the oven and bake for 45 minutes until peppers are softened and lightly charred. 5. Serve on a bed of rocket and top with grated parmesan cheese.